At the youth level, there is no professional grounds crew — just coaches, parents and players responsible for keeping the fields watered, free of debris, lined and ready for play. While many don’t think baseball field maintenance is a big deal, an unkempt playing surface isn’t just unsightly — it can be unsafe. Infield lips can lead to foot and ankle injuries, ant hills and divots in the outfield can lead to tripping and foot injuries, and poorly kept pitching mounds and bullpens can lead to hamstring and leg injuries. Yes, baseball field maintenance is important for players at all levels. Good maintenance should be performed all year. For instance, it’s after the season in the fall when tasks such as reseeding the grass, aerating and fertilizing should be done. Reseeding plants roots for new grass to fill any bare patches or light areas, while aerating and fertilizing help deliver precious oxygen to the grass roots and encourage a healthy, lush surface when play is ready to resume in spring. Right before the season starts, the field should be fine-tuned to account for any wear and tear it endured during winter. For instance, any lips should be repaired, and the pitching mounds on the field and in the bullpen should be bolstered. The former is done by adding the appropriate amount of dirt to ensure a smooth transition in the playing surface between the infield and the outfield, while the latter is best accomplished by adding packing clay around the mound or clay bricks underneath the mound to give it a firm, sound foundation for the pitcher to throw from. Mowing: On most youth fields, mowing will only be done on the outfield, but there are some youth baseball fields that have grass in the infield as well. When mowing, never take more than one-third off the total grass length. Also, use a mower with sharp blades, as dull blades can damage the grass. To make the field look extra nice, try to mow in straight lines or eye-catching patterns. Infield Raking: The more the field is played on, the more the infield dirt is due to be jostled. Regular infield raking and spike dragging should be performed and topped off by having it rolled with a 1-ton roller. If a roller isn’t available, don’t skip the raking and spike-dragging steps. This helps keep the infield area neat and playable. Preservation: When it rains in a professional baseball stadium, the infield is covered with a tarp. Your youth baseball field likely doesn’t have the same luxury, but try, at least, to cover the pitcher’s mound with a protective tarp between games. This helps prevent mound erosion and limits the amount of in-season maintenance you’ll have to make. Lip sweeping and raking should also be done at least weekly and mound plates should be checked on a weekly basis, too. Just because youth baseball players play ball on a youth field doesn’t mean you can’t give them a great ball-playing experience. Remember, a well-kept youth baseball field doesn’t just look great, it also allows for safer gameplay. 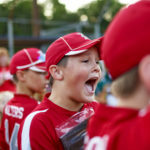 When it’s youth sports, a safe, enjoyable experience should be the No. 1 goal. Shanna Brenner is the Marketing Director of CoverSports, an American Manufacturer of baseball and softball field padding, protection, and privacy products.